The American Eagle gold coin has been produced by the US Mint since 1986 and represents one of the best gold bullion investments in the world. Not only do these coins have a 22 karat gold content, but they are recognised all over the world and have a high liquidity value – so when the time is ripe to sell, you will not have any problems cashing in on your investment. This is just one of the reasons why the American Eagle gold coin is one of the most popular bullion products on the current market. American gold Eagle coins were first minted in 1986 and are backed by the legal constitution of the US government. Given the US dollar is a much sought after currency and recognised all over the world, gold bullion produced by the US Mint has global appeal and commands a high fee. There are few bullion coins with the same strength as an investment tool than the American Eagle. As one of the most popular bullion coins in the world, it has a high liquidity factor and is often purchased by experienced investors to hedge against inflation and diversify their investment portfolio. American Eagle coins have a unique and distinctive design that is rooted in history and esoteric symbolism. On the reverse side of the coins are the double eagle design which was originally commissioned by President Theodore Roosevelt. The Eagle of course is a symbolic creature representing the strength and stability of the United States and in Miley Bisek's portrayal we see a family of golden eagles building their nest. Whilst the male returns home brandishing an olive branch, the mother protects her young in the home. These age old traditions have been a mainstay of US families since the official founding of the country in 1776. The reverse side also states the country of origin in which the coins were made, UNITED STATES together with the weight in FINE GOLD and the face value of the coin 25 DOLLARS. Flanking the image of the Eagles are the mottos of the US Senate, the Latin E PLURIBUS UNUM meaning “one out of many" and “IN GOD WE TRUST." On the obverse side of the American Eagle gold coin is the figure of Lady Liberty, a symbol synonymous with the United States. This particular design was created by Augustus Saint-Gaudens and was originally intended for the $20 dollar coin which was minted between 1907 and 1933. The US Mint subsequently chose the same design for the modern day version of the American Eagle coin. The year the coins was minted is also engraved on the obverse, together with 50 stars representing each of the US states. In the bottom left corner is the Capitol Building where US law makers gather. It was here that the American Eagle gold bullion coin was authorised as legal tender in 1985. 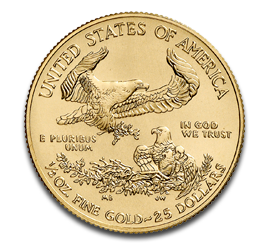 Modern day impressions of the American Eagle gold coin was minted in 1986, although the first coins of their kind were originally minted way back in 1795. At that time the coins were modelled in the English Crown and contained 22 karat gold, but the purity was lowered in 1837 to .900. When the US Mint decided to reintroduce American Eagles as gold bullion coins available to private investors, they upped the gold content to 91.7% again to mirror the original mintages. They also chose the iconic symbol of Lady Liberty as the image of the coins designed by American Renaissance sculptor Augustus Saint-Gaudens. The image was personally commissioned by President Theodore Roosevelt in the early 20th Century. The American Eagle bullion coin became legal tender under the provisions of the Gold Bullion Act of 1985 and were released into circulation the following year. The image of the eagles was created by Miley Busiek, also known as Miley Tucker-Frost who has contributed several sculptured images to the White House together with the Smithsonian American History Museum and the University of Austin. The US Mint has a worldwide reputation of producing high quality gold coins manufactured with advanced security measures to protect investors from fraud. The intricate design and privileged mint marks make the coins impossible to counterfeit without detection. The experienced dealers at CoinInvest GmbH can verify the authenticity of all American Eagle coins we sell so you be certain any gold bullion you purchase from our online store is authentic. 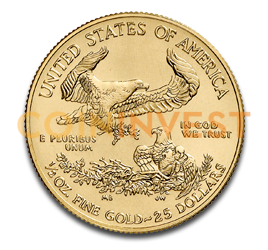 Buying American Eagle gold coins from the CoinInvest online store could not be easier. Simply select the number of coins you would like to purchase to the right of your screen and add them to your shopping cart by clicking on the button marked in orange. Once you have told us the country you want the coins delivered to, follow the online instructions and proceed to check-out. If you have any American Eagle gold coins for sale, we offer fair prices based on current market value. Contact a member of our friendly staff today and we will confirm a fixed fee offer by email at the earliest possible convenience.